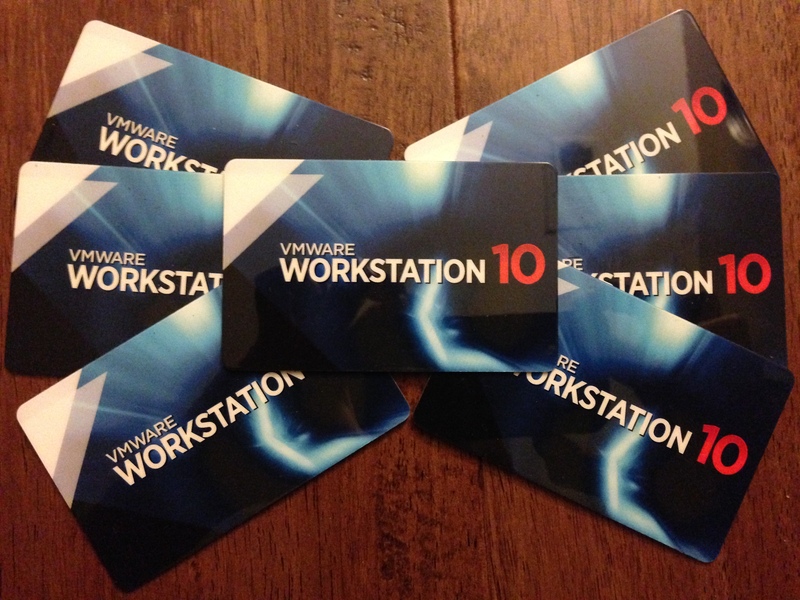 Want a free VMware Workstation 10 License? You are here: Home / Workstation / Want a free VMware Workstation 10 License? I have in my hands, seven VMware Workstation 10 licenses worth a grand total of $1,743 ($249 USD per license). I would like to give a big thanks to the VMware Workstation team for donating these seven licenses to me so that I could give away to my Twitter followers. If you are interested in learning more about VMware Workstation or have any feedback/questions for the Workstation team, you can follow and interact with them on Twitter at @vmw_workstation. One pretty neat feature of Workstation is the ability to manage your ESXi hosts including Free ESXi which really could come in handy. So, if you want a super easy way to win a free VMware Workstation 10 license key, then CAREFULLY READ through the instructions below to see how you can score a free Workstation license! You must be following me on Twitter, I am at @lamw and I will be contacting winners through Twitter. Leave a short comment on this post on what this VMware Workstation license key would enable you to do, whether that is solving a particular problem or challenge. What is the one feature that you are most excited about for new users or what new feature would you like to see for existing VMware Workstation customers. Simple, right? I will randomly select seven winners from the list of comments in one weeks time, so make sure you leave your Twitter handle in the post else you will not be eligible to win. This is open to everyone, you do not need to live in the US to win. @gallifreyan here. I have a time-limited Workstation license and an even older (v2.1? Circa 2000 on biz-card CD) version; I’m thinking about replacing an esxi NUC at home with a 17″ 4-dimm laptop for recreational virtualization… and I’d actually love to see some sort of mini-vMotion feature to move between laptops/desktops (offline most likely), or maybe a way to auto-templatize VMs so you can, say, build one Hadoop node or desktop instance and then copy it a few times automagically. I’d like a VMware Workstation license, please. I haven’t used VMware Workstation previously, as my work has been primarily in VMware Fusion on my Mac, so everything in VMware Workstation will be new to me. I’m looking forward to comparing between the two products and exploring the features in Workstation. I’m especially looking forward to explore the use of Workstation as a VMware ESXi management console. I’m at @rtrouton on Twitter. I was able to obtain my vcap-dca 5 by using the nested lab approach all running on workstation 9 and version 10 will be nice to have to start working on the other certs on my radar.. including cloud, dt and vcap-dcd. William I currently run VMware Workstation 8 in this I can’t host Winows Server 2012 VMs, with a Workstation 10 license I could. Workstation 10 also would allow me to easy transfer my VMs to vSphere 5.5 server estate when needed. It would be great if VMware Workstation VMs could have simple power on \ off and view console by vCenter console for use in homelab. I would love a workstation license. I would use it to prepare a lab environment to prepare for the VCP exam that I plan taking at the next VMworld. The feature that I would like to see is the ability to create a vsan group of hosts by somehow tricking workstation into thinking you were using SSD drives; maybe some kind of vsan virtual appliance for testing. I have a mixed homelab with ESXi hosts and Hyper-V hosts, I would like use the ESXi and VM management feature in the new Workstation 10 to manage my lab with the VMware Workstation.. So if you could provide me with a Workstation 10 license that would be awesome! Again thanks in advance, love the this VMware Workstation team does for the community. I’ve just completed the VSphere Install, Configure, Manage course and could use a Workstation license to continue studies towards the exam. I presently have an Intel NUC running ESXi in my home lab using FreeNAS for storage. I do a lot of malware reverse engineering as a hobby and VMWare is one of the best tools for infecting computers and trying to pull the malware apart. I currently use Player, but this requires manually copying machine states rather than snapshotting. This would make my life so much easier. Thanks! Hey William. Great idea. I would stop using VirtualBox since I recruit for EUC and SDDC at VMware. I would replace my VirtualBox install with WorkStation and be better able to discuss the awesomeness of it when talking with candidates for your team. I would run the Cloud on my PC feature as well. Being a Ubuntu user I could also install the MS VM for those rare times I need to use that OS. Thanks for doing this William! And thanks to the Workstation team too for the generous giveaway. A VMware Workstation 10 licence key would enable me to easily manage the ESXi Free edition hypervisors in our IT Lab here; something which can be a challenge with the regular vSphere client! I would love to be able to use the ability to manage all of our ESXi servers from a single desktop based interface. I would also like to try the built in P2V feature to see how it compares the the basic free converter. (Plus it just seems so much better then the old version I use to use back in Uni). I’m a Windows administrator who plays around with all kinds of virtualization and with VMware workstation I can use nested virtualization to more easily use the different hypervisors concurrently. With regards to new features I’m very curious how the virtual tablet sensors will work and I also like the idea of being able to time restrict VMs. 3. I will say on the work side of things I love the capability to build out in workstation and then drag and drop the VM into either vSphere or the cloud. Pretty handy. 4. Hi, I’m @k00laidIT ! i used a lot of virtual machines in my training to an it specialist. It helped me alot. With the VMware Player i could copy all that machines to every place, and that is a great thing. Now im ready to make some it certificates and it would be good to learn at home with snapshots instead of copying the whole machine and to say “its moved/copied” (cause of the configuration of an exercise). At home i also use it to run virtual machines for fun and security in the web. I also love it to test things very hard (destroy configurations to make them new and learn it), cause you cant do that with a physical machine. I also prepare new Windows/Linux OS to get some knowledge about the new stuff. At all: It would be great to use the VMware Workstation. So that’s why I’d like to win a license to the latest views VMWare. Let me explain, I have a license for this software version 9.0, unfortunately this is not the latest version here because I take part in this competition. Namely, the program I use to explore different operating systems. With this app I learned a lot and met a lot of systems. I would like to continue your adventure with this product so very happy to take part in the contest with the hope that I can get it. I would like to develop a proof of concept that would allow developers and other users to automate “cloudbursting” their VMs and applications running on there local system via Workstation to a Vcenter private or public cloud. A feature I would like to see for workstation would be the ability to assign per VM QoS settings such as shares or thresholds for Storage, network thresholds, memory, etc. I would love a license to VMWare Workstation! I just built a nice development rig for home and have been looking to at Workstation for to run on it. Being a software developer I constantly have a need for spinning up test vms and taking them back down. The features I like most is the virtual tablet sensors. I am about to start working on mobile development so this is nice! VMWare Workstation fills The gap for us between esxi products, which we use and love for our cloud Infrastructure, and desktop products like player, not capable enough for some of our needs. The best thing as a new user is the possibility to view and use any VM from my ipad browser, which is awesome. Only thing i wish was there it’s integration with vcenter, which afaik is not possible yet. I’d like use use VMware Workstation to practice and learn. I’m looking to obtain my VCP, and I think this would assist me greatly in creating labs for learning. I like the fact that you can use Workstation to manage and administer the free ESXi based server. This would come in handy to my small limited budget and only being able to learn using the free version. Thanks and you’re site is full of great tips and knowledge! I’d like to run Workstation at home so that I can setup VMs for each of my daughters. They are into math, science, and computers so I also hope to begin teaching them virtualization concepts. Also, running free esxi hypervisor would be a win for me. Because much of the UGG’s trademark stitching is visible on the exterior of the boot, it offers another way to spot a fake. If the stitching is uneven, if the seams are crooked or if some stitching is missing where the seams connect, your product is probably counterfeit. The same is true if the sole is inflexible; authentic UGG boots feature a thick but pliable sole. I have just finished taking the VMware vSphere ICM 5.5 course, and am looking to obtain my VCP. Vmware Workstation 10 would help me to prepare for the VCP exam using a nested lab approach. Thanks, for this great opportunity to win a free Workstation license! Vmware workstation will help me step first practical steps with vmware products. I’d love a Workstation 10 licence. I currently just use a standalone ESXi server for personal projects, but it’d be great to run my own virtual lab and get my teeth into the much bigger picture with vCenter. I personally can’t afford “datacentre dollars” for production-grade server hardware, but Workstation would make it possible for me to break into the industry and get certified with relative ease! As for the new features, I have recently gotten into mobile app development so I’m very interested in WS 10’s ability to simulate tablet hardware. @ttlequals0 this licences will allow me to continue to experiment with virtulization. currently i have a couple esxi boxes and use virtual box but would love to stay in the VMware ecosystem. Workstation will allow me to manage some of my 5.5 hosts that I inherited from another admin. We are using the free license on them and they are in a remote office so I can put them together and access them all from one console. Make my daily grind a little less friction filled. One feature I would like to see is an integration with vcenter. Be it the appliance or what being able to manage all my hosts and Vcenter instances from the console would be great. VMWare Workstation is the best for running and test different configurations of Servers, Enterprise Asset Applications and for training others on the use of software and programs. I have used earlier versions to train individuals and groups on Ibm Maximo both remotely and in a classroom setting. It allows for easy transport using a laptop to carry the systems with you without having to have a hard server setup. Dependable and easy to have as a training aid. On tweeter @tbonpc. Thanks for this giveaway. Sure ready to get this latest. I currently use a Mac and run Parallels, but I have been interested in VMWare for a long time. I am curious how it would run in comparison to the VM I use daily. Plus, I just saw an announcement today about VMWare Fusion Pro and the ability to roll out restricted VMs for BYOC at corporations. This is a great feature that the competition doesn’t have an answer to. I would love to try out VMWare on my machine. I appreciate the giveaway and will add your blog to my newsreader. This license key would allow me to upgrade the VMware Workstation 9 version that I have now on my laptop. I currently use my VMware Workstation to install and test software. I also use it to study for VCAP exams. One of the features that I love is being able to connect and manager ESXi hosts. New feature I would love to have is the ability to import virtualbox vm’s. Thanx for the very kind offer William!!!! I travel alot, so being able to work on my many IPv6 related projects while flying would make life very grand. I could configure a various robust/diverse lab system by configuring multiple brands of routers, firewalls, and clients OS’s, in multiple virtual networks. It is a great way to learn when having physical equipment is not always possible. Would also allow to demonstrate same in presentations, again when physical gear isn’t possible to travel with. This new VMWS10 would allow me to upgrade from my Ver8, convert some of my VirtualBox VMs to VMWS, and I can access my ESXi servers – all very awesome capabilities!!!! Thanx again, have a great week!!! @VFrontDe here. I’d love to use VMware Workstation to run a mobile nested vSphere lab. Hi, first thanks for all of us. And I hope that next time you will be giving vSphere licences 🙂 , that would be really great for us who still needs to rebuilt our labs again and again. 3. The new version has support for the latest operating systems. We have many customers coming with latest OS versions. To keep our software updated we need a lab to play with all OSes. Also, we would like to move slowly into Cloud and a lab build with VMware Workstation 10 will be great at this point. 1.The license will help me setup virtual environments that will help me test new operating systems and applications on a sandbox. Also for my work to test things in my lab before doing them on a production environment of a third. First of all thank you for the opportunity of win a VMware Workstation license. I would like to have a VMware workstation 10 license in order to build a nested lab at home. I’m planning on getting VCP-DCV certification and also some MS certification this year. It would be great to build a home lab with the new OS compatibility to try lots of configurations. Awesome giveaway! So many uses for VMware Workstation – Managing non-vCenter ESXi environments, testing out vSAN, and full-screen VMs! What’s not to like? Since I need to recertify within the next year (current VCP5 cert if over two years old), it would be awesome to have a tool to run a test lab on my workstation. It would be a nice feature to be able to ‘sync’ the VM’s when I am at work with our production farm/cluster to use the processors from the servers during daytime, and take the testlab-VM’s home in the evening. A Workstation 10 license key would enable me to set up a virtual home lab for vSphere 5.5. I am certified VCP4 but the recent change in the rules regarding recertification mean that I need to qualify VCP5 in the near future. Time is too short during office hours so I need a license for home use. The most exciting feature for new users has to be the ability to snapshot and revert VMs. This is vital for testing configuration changes or for building from a known baseline. Keep up with the good work on the blog. I am looking forward to trying VSAN. My Twitter handle is @ITSteveYoung. I’m a Systems Engineer currently, and part of what I’m lacking in version 9 of Workstation is the ability to use Windows 8.1 VMs. I love to experiment with the latest OS’es to learn, deploy, troubleshoot, etc., and for my career, it’s required. Version 10 would help greatly. I’m also very interested in the “Cloud from Your PC” idea, as that is the avenue of the future, and being current is an advantage. (Twitter @lgeeklee) My Workstation 8 license is a bit long in the tooth now (from VCP5) and it does a lot for my home lab, but a Workstation 10 license would help me run 2012/2012 R2 VMs with VMware tools! and help with managing a couple of ESXi lab hosts when required. The nested hypervisor support is great – so useful creating and tearing down home lab setups. @svisnjic following you on twitter for about 1 year. Would love stop using VirtualBox on my home lab and playing new version of AutoLab + VSAN. Also, I would like to develop a proof of concept of VCloud and SRM in a Box. I really need Workstation 10! The features I look forward to the most is the increase of resources (e.g. 64GB RAM), the ability to have up to 20 networks and the up-to-date guest OS support. 2. Having Workstation 10 would allow me to continue development on a vMotion detector app (http://sourceforge.net/projects/vmotion/) I originally wrote for Nagios and Oracle OEM. And since Workstation 10 can interface with ESXi hosts, I can extend my development and testing needs against my ESXi 5 cluster and expand into active testing for other monitoring tools as well. 3. Having the capability to control / support older ESX/ESXi platforms via Workstation 10 is one of the things I really want to test as the company I work for has a mix of ESX 4.1 and ESXi 5.1 and 5.5 hosts. And since the company I work for and my personal environment has a mix of Windows and Linux platforms, I want to test to see how the two Workstation platform application differs, if anything, in the way of features when run on these two OS environments. 5. Nope. VMware even tried to recruit me as a TAM (I didn’t have enough vCloud experience, oh well.). I am a contractor/consultant and frequently find myself creating virtual machines under VMware Player and KVM, but have always found Workstation to be a more useful platform for quick development work, when available. I would like to enhance my home development platform using VMware Workstation, both running virtual machines directly as well as managing the free ESXi platforms I bring up from time to time. I would especially like to explore API control of virtual machines under Workstation for auto-provisioning, much like the scripts and APIs shown in virtuallyGhetto with its larger brother ESXi. For new users, I believe the ability to use Workstation to manage ESXi platforms a key feature for adoption of Workstation into both existing and new ESXi and vSphere implementations (such as in labs). Hey William, big fan, and I’ve been reading and following your site for a while – thanks for all the awesome info and tips, I’ve used a lot of your ESXi related posts and info when running my servers (especially the image profile article, which I use now anytime I update – http://www.virtuallyghetto.com/2012/09/a-pretty-cool-method-of-upgrading-to.html)! I’ve been running a few ESXi free servers for a while, and I do a lot of testing and development work, so I currently have an old box set up with ESXi locally for testing, but getting a Workstation license would make things so much easier for me, and allow me to run everything in VMs on my local PC. I’ve been very happy with the VMWare offerings in general, and I especially love ESXi, but I need to see them release a way to manage version 10 VMs from the free vSphere client. Until then, having a Workstation license would really come in handy, and let me manage my ESXi free servers much easier, without the vSphere client limitations. Otherwise, every new release brings cool new features, many of which I didn’t necessarily think of before, but I often end up using and appreciating a lot once I have them. Thanks William, and thanks VMWare! I’ve used my VCP workstation 7 license quite a lot but I eventually became fed up with all the vmnet module patching that newer kernels needed.. I’ve seen that Workstation 10 no longer needs module voodoo, so i would really be happy to upgrade to version 10. – I don’t know if this has evolved with versions and is already present, but I think there should be a way to know what resources are being used by each virtual machine, Even more, being able to see the TPS savings would also be a nice plus. – Regarding vSphere integration, as far as I was able to test, workstation was not able to show individual hosts. I don’t think it would be that difficult to provide information on the hosts: CPU usage / RAM usage / Alarms / Datastore Usage. Even a way to monitor events such as ongoing HA or similar would be nice. Only monitoring, i don’t mean to convert workstation in the new Non web based vsphere client. – I would personally love to do restore tests in my workstation from VDP instead of adding extra load to the ESXi servers. – Ability to dedupe VMDK files. Most Workstation users don’t have underlying storage supporting this feature, and most OSs won’t be installed with a deduplication aware filesystem. It can be time consuming, but a really good space saver for people working with quite a lot of different virtual machines. Consolidation has always been there, but doesn’t take into account duplicate data, just sparse blocks, right? My twitter account is @MaureenCioe. I have been using PowerCLI to automate many of our admin tasks and now I want to tackle our VM deployment. Sadly, my lab is overwhelmed and setting up a Workstation environment would definitely help all the way around. Thanks for this opportunity and keeping up a great twitter account. I really want to get stuck into learning vsan, so would use my workstation license primarily for that task. I think a cool feature would be to have the ability to build set of machines at the same time, maybe from a pre defined list of configs / scenarios. This license key would make it so much easier to build and use testlabs when studying for certifications. The new feature that I am most excited about is the improved multi-monitor support. I would use Workstation 10 to explore the new features of vSphere 5.5 and perform upgrades from vSphere 5.1 to vSphere 5.5. I’m followibg from @robdurkin, I’d use a workstation license at home (already using at work of course) to test system setup and deployment. I took a new job recently, and we are doing desktop and server refreshes…lots of trial and error. I love the new feature where I can run multiple VMs full screen and use the KVM key to switch between them. Thanks for running this contest!